The U.S. Department of Energy has granted approval for SLAC National Accelerator Laboratory -- home of the Linac Coherent Light Source (LCLS), the world's first hard X-ray laser -- to begin planning a second X-ray laser at the laboratory. 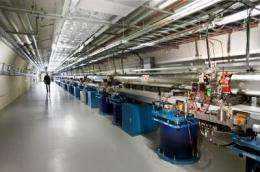 The LCLS, which began operation in April 2009, generates ultra-fast, ultra-bright pulses of X-ray laser light which are already providing new insights into the atomic world. LCLS-II would give investigators access to new regions of the X-ray spectrum and improved control over the X-ray beam. It will also accommodate a larger number of research scientists working simultaneously. "The LCLS program has been an unprecedented success, from conception to construction, and into operation," said William Brinkman, director of the DOE's Office of Science. "We are very much looking forward to the exciting science to come from this unique facility." The LCLS stands to revolutionize a variety of fields, including chemistry, biology and energy sciences. The LCLS is the world's first laser to create light in the form of hard X-rays, generated using SLAC's existing two-mile-long linear accelerator. The laser's ultra-fast, ultra-bright X-rays give scientists the ability to visualize matter on the atomic scale, where the action is measured in quadrillionths of a second. Scientists are now using LCLS beams to study how individual atoms and molecules move and behave, with an eye toward creating the world's first "molecular movies," revealing the mechanics of chemistry as it happens. Although a number of hurdles remain before construction could begin, the current milestone, or "Critical Decision 0," granted by the DOE clears the way for scientific and technical teams to officially begin work on conceptual designs for LCLS-II. "The success with the commissioning and early experimental operations of LCLS exceeded even our optimistic expectations and paved the way for significant upgrades of capability and capacity," said SLAC Director Persis Drell. "The CD-0 for LCLS-II gives us clearance to begin planning to extend that success and push the scientific envelope even further." The LCLS-II project will center on two new undulator arrays—the long series of magnets used to generate X-ray light from an electron beam—as well as an upgrade of the existing LCLS undulator. When complete, the facility will produce multiple X-ray beams that could operate either together or separately, with unprecedented flexibility and control over a much-extended range of X-ray energies—key to exploring precise regions of the atomic realm. LCLS-II will provide the added capability of tailoring how the X-ray beam is polarized—essential, for example, for detailed studies of magnetism, which could lead to better information storage, and of exotic materials such as superconductors. The new capabilities will give researchers improved insights into processes like photosynthesis with the hope of creating more efficient methods for harvesting solar energy. Importantly, the LCLS-II will address the surging demand for access within the scientific user community, by supplying multiple research groups with X-rays simultaneously, instead of serving a single user group at a time. Joachim Stöhr, director of LCLS, said, "It's a very exciting time at SLAC, and for the rapidly growing community of users. This is truly the beginning of a new era for science." I don't see why we don't build particle accelerators/colliders in a true oval (think: racetrack shaped) and use high powered lasers to give the particles a kick in the pants on the straightaways. It seems to me this would be much more efficient than the current systems. On the turns, you'd use steering magnets just like we currently use in circular particle accelerators/colliders. And you'd still use accelerator magnets throughout. The lasers would just give an additional, linear boost.